This is an exceptional, spacious unit that sits on the beach with stairs right to the sand from your private wrap around deck. Everything you will need to have a great vacation is yours. 1st story luxury with only a few steps down to the beach from our 1800 square feet condominium. 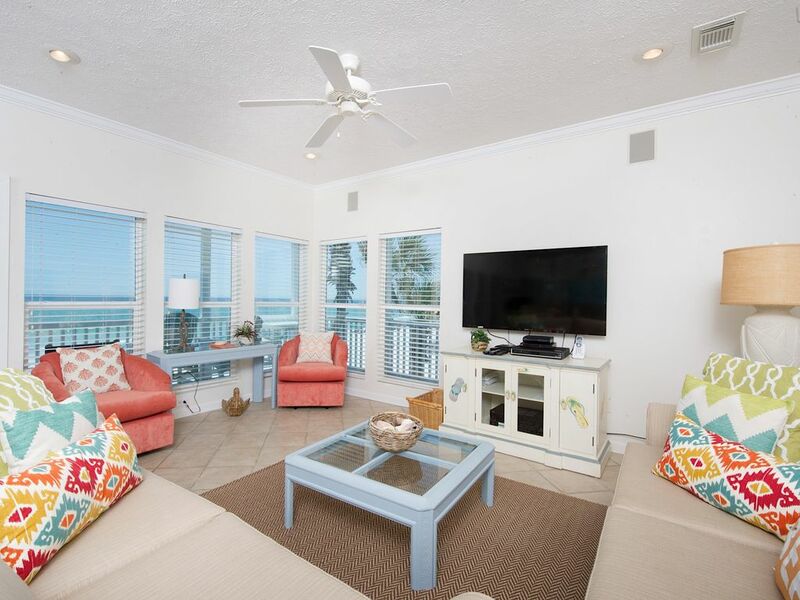 The Sugar Dunes complex has 24 condos, in the best of the Seagrove area, and is located in a less populated rental area between two great (but crowded) gulf towns of Destin and Panama City. You want more? Visit the quaint colorful town of Seaside or Rosemary Beach by biking or car just a few miles away. Even more? A State Park with bike trail just 500 yards from the unit. What a great place for your family vacation. You can't beat it for luxury on the beach, at affordable rates for family vacations. After one stay you will be hooked on our 'you-can't-be-closer' accommodations. We have a very high rate of return rentals -- so get your reservation in and join the other satisfied vacationers of the 'Myer's on the Beach' condo. Includes 2 chairs and 1 umbrella for rentals between Mid March to Mid August. Can see Eastern Lake from the Wrap-around deck. Kitchen is loaded with everything you will need. Large pots, multiple other pots and pans, lots of plates, glasses, utensils and serving pieces of all kinds. Toaster oven, coffee maker and much more. Smart TV equipped with TIVO. NetFlix is also available with to use with your account. Beautiful deck. Stretches the entire length of the condo and wraps around west corner. Lots of seating and table for eating. Also, there is a storage closet with extras for fun on the beach. The condo was emasculate, well-stocked to meet our every need. The sunset and ocean views to die for. We thoroughly enjoyed are stay and are hoping to book again this July!!!! My family and I had a fantastic time! We have been to Seagrove many times, but this was our first time staying at Sugar Dunes. We absolutely loved your condo! By far our favorite spot in Seagrove! You just can't beat that view and the proximity to the beach. Plus we loved that it was a corner unit on the first floor. Seeing the palm trees out of the side windows was magical. You never know what the weather will be like this time of year in Seagrove...we lucked out and had pretty great weather. It was in the low to mid 70's. Sure a little rain and a little fog, but we also had a lot of sunshine! The sunsets were out of this world. One of our favorite activities was to pour an evening cocktail, relax on the porch and wait for the sun to fall into the ocean. We didn't get one every night, but the ones we were able to experience were breathtaking. Thank you again for opening your lovely place to us. We will be back for sure to see...that view! Thank you so much for the wonderful review! Sugar Dunes is a hidden gem. We look forward to having you stay with us again! We have stayed at Sugar Dunes the last 4 years...we loves these condos. They are right on the beech and the view is wonderful. The condo was clean and the beds slept good. We definitely plan on returning next year! It is very nice to have stairs that lead from your balcony directly into the sand. We are thrilled you found Myers on the Beach to be clean and comfortable, and hope you will continue to return year after year. Thank you for your kind review. I would definitely recommend Sugar Dunes #1 had everything we needed for or week long vacation! Thank you so much for your wonderful review! We are so glad you enjoyed your stay at Myer's on the Beach and look forward to your next visit! Great location. Right on the beach! Sugar dunes1 is a wonderful unit. All was as described in the description. Bed were comfy and the unit was well equipped. Clean and comfortable. The views of the ocean are fantastic and good seating on the back porch. We had wonderful weather and would definitely rent again. We had 6 adults and the 3 bedroom and 3 baths were perfect. We are so glad you enjoyed your stay and found everything to your satisfaction. It is important to us that we provide the comforts of home away from home. We hope you will stay at Myer's on the Beach again in the future. You were a pleasure to have. My family just enjoyed a great week-long stay at "Myers on the Beach". The location is really hard to beat considering that the condo is steps away from an amazing beach that isn't overly populated, even during one of the busiest weeks of the year since we were there over Memorial Day weekend. We had stayed in Seagrove before and really like the easy access to both Seaside and Rosemary communities. The beachside porch was spacious, beds were very comfortable, and the kitchen was well equipped. We only had a few minor issues during our stay. The wifi at the condo was spotty at best, and we had several different types of devices that couldn't seem to connect with any consistency. We also had an interesting dynamic of the owner of our condo staying in a separate condo directly behind the building while we were there, and we had our hand slapped for keeping the exterior sliding door open too long shortly after arriving at the condo. I understand the need to keep the door closed to keep the AC from freezing up, but it caused us to feel like the owner was constantly watching our every move. We also had some issues with the owner and the umbrella company, with him providing some very strict guidance to the rental company about where his umbrella had to be located on the beach despite the fact that he wasn't out on the beach. We were simply hoping to have our umbrella beside our tent, and he was very strict with the rental company that his umbrella had to be at the end of the line. Thankfully, the umbrella rental company was great to work with and they were willing to be flexible to help us meet our needs despite the protest from the condo owner. Finally, one other minor turn off was that the condo building itself has very strict rules that tents can't be placed during behind the building, requiring us to place our tent over to the side. We had a very good stay and our issues were minor, but wanted to provide an honest review of our experience. We really are glad you enjoyed your stay. We believe this is one of the best spots along 30A. The rules that have been set either with the condo complex or our specific unit are not meant to be a burden for guests. Rather, they are attempts to be sure everyone gets to enjoy the scenery, as well as care for our properties. The association ruled a long time ago to not accept canopies in front of our property, because this property is not built on a cliff like many. So, when you look out, we don’t really want to see a sea (no pun intended) of canopies. The reason people love this complex is because of the views of the water and the ease of getting to the sand and ocean. We did happen to be there, our other condo close by, during your stay. However, we never meant to make you feel uncomfortable. We did ask once that the sliding doors remain closed if you are not going in or out of them and wanted to be sure you were aware that leaving doors open while the HVAC is running can lock up the system and cause you to not have AC. We love our condo and really want it to be cared for. That is all we were trying to do. The beach, the BEACH!!! Its right out the window and the deck, Thats why you will love it!!! Also you have many other activities Hiking, shopping and all the resturants along Highway 30A, It the best place to be with quiet surroundings and private BEACH!! !